The London Marathon is just around the corner! Is your team ready? If your team are heading to the London Marathon on the 28th of April, then it’s time to make it official. Sure, you may have been training together for the best part of a year or longer, but nothing quite unites a team like the same goals and a personalised printed T-Shirt to round things off! Whether your team is built upon a New Year’s resolution or your raising money for a charity close to your heart, let the team here at JKL help you share your achievement with the country. 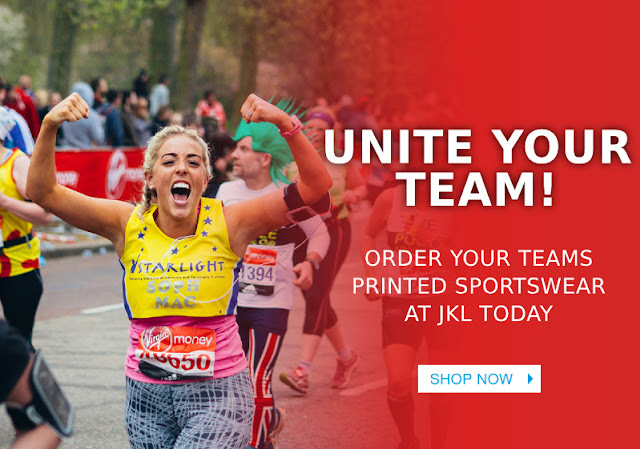 From your fellow running companions to the ones cheering you on at the sidelines; at JKL we are a one-stop-shop for high-quality garments and printed services. Here at JKL, we have a wide variety of high-quality garments ready to be personalised to fit your needs. Whether your team is looking for t-shirts, vests, base layers or a mixture of garments we have the solution for you. With an aim to beat any like for like quote, printing your selected garments has never been easier! How Do I Order My Teams Printed Garments? There are currently three ways that you can order your teams personalised clothing. Whether you have already found your items on our store or you’re still browsing, the process is simple. Find the clothing garments that you need and add them to your basket in the sizes you need. Once they are in your basket select customise. Follow the simple procedure to produce your quote. Our personalised clothing form is readily available online to fill out. Simply enter your detail and attach the artwork you want to be printed and one of our team members will get in touch with a quotation. If it’s your first time placing a printed order and you’re not sure of the process and procedure then give us a call (0114 239 8000). One of our team members will be happy to assist you with your query.